This year’s Sunoco Whelen and 240 Challenges hit their stride over Easter weekend at Oulton Park where the British GT Championship and Mini Challenge JCW class were making their first appearances of 2017. The Britcar Endurance Championship had been the only other Sunoco Challenge-eligible category in action up to that point, which offered drivers in both British GT and Mini Challenge a chance to make an early impression. 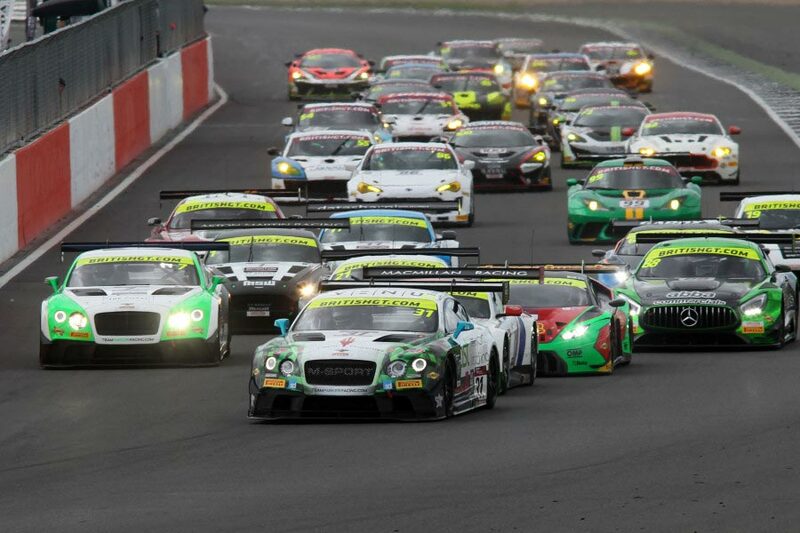 A change to this year’s rules has opened up the senior competition to British GT4’s professional drivers. And with three of GT3’s leading contenders – former Challenge winners Phil Keen, Jonny Adam and Seb Morris – all ineligible for the Rolex 24 At Daytona prize drive, it was a Silver Cup GT4 crew that made the most of an action packed first weekend. Lanan Racing team-mates David Pittard and Alex Reed won Monday’s second GT4 race after finishing fifth in the opener to not only establish an early lead in the class standings but also hold a slim advantage in the Sunoco Whelen Challenge points. The Ginetta pair both scored 85.25 points, 2.75 more than leading GT3 driver Matt Griffin whose FIA WEC and ELMS commitments prevented him from qualifying on Saturday. He’s level on points with three more GT4 entrants: Mike Robinson, who twice finished third, and HHC co-drivers Will Tregurtha and Stuart Middleton, who claimed second on their British GT debuts. Adam Mackay sits seventh after winning Monday’s first GT4 race, while Jon Barnes is also in contention thanks to a consistent weekend at Oulton Park. Jon Minshaw’s double victory, fastest lap and second quickest qualifying time have given Barwell Motorsport’s British GT Championship leader a handy early advantage atop the Sunoco 240 Challenge standings. His average score of 132 is 16.5 more than reigning GT4 champion Graham Johnson could muster. The PMW Expo Racing/Optimum Motorsport driver twice finished third in class but, crucially, picked up additional points for being the fastest Am driver in qualifying and both races. Rick Parfitt Jnr’s pole position and fastest GT3 Am lap in the second round compensated for two otherwise tough races, but the Team Parker Racing driver still finds himself third in the Sunoco 240 Challenge table thanks to an 88-point average. He shares the position with reigning British GT3 champion and former Sunoco Whelen Challenge winner Derek Johnston, who twice came through from 11th to finish second and third. Positions five to seven are shared by Mini Challenge drivers, with Charlie Butler-Henderson and JCW class rival Mark Wakefield both half a point behind Parfitt Jnr and Johnston but 2.5 clear of Brett Smith. British GT4 race winner Adam Balon is a little further adrift in eighth, with British GT3 driver Mark Farmer and Mini Challenge racer Rob Smith completing the top-10. Javier Morcillo is the first of Britcar’s entries in 13th, albeit 84.25 points behind Minshaw. 2017 Sunoco 240 Challenge winner Max Bladon would be level on points with fellow Mini Challenge racer Brett Smith were he not ineligible to compete for the Daytona support race prize drive this year.